Friday, July 10 – Saturday, July 11, 1914: Forgot the particulars of these days. 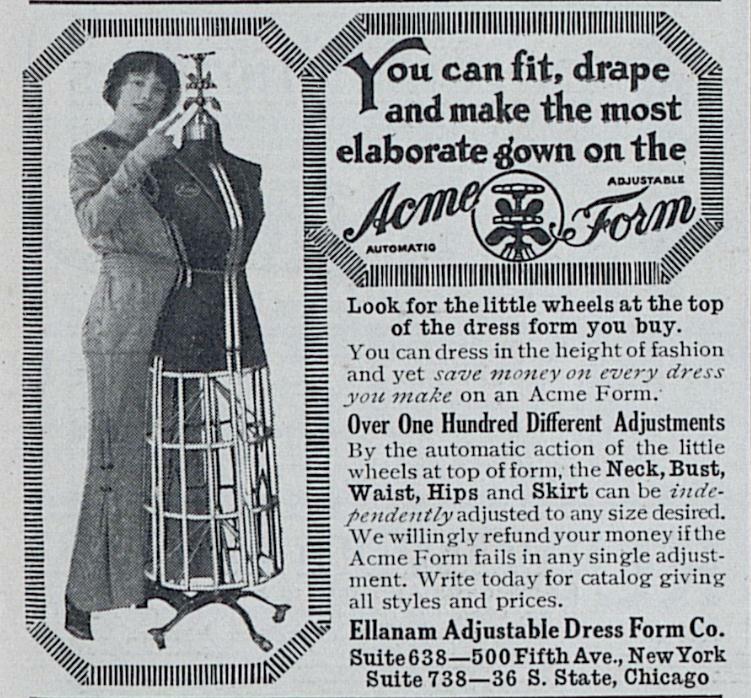 Since Grandma didn’t write any specific for this date, I’ll share an advertisement that I found for Acme Dress Forms. I knew a few people who had dress forms when I was a kid. Does anyone have them anymore? Posted on July 11, 2014 July 12, 2014 by SherylPosted in AdvertisementsTagged 1914, family history, genealogy. I actually own a dress form right now but would love to have the one you pictured. I do a lot of sewing and am probably more of a tailor but love to have a garment on my form that I can see and admire. Wish I could have the one above!!! It’s awesome that you have a dress form, You must be a very skilled seamstress. I bet that you make some beautiful outfits. Thanks for finding this wonderful link. It’s fun to see several of these vintage dress forms. Wow, over one hundred adjustments, I have sewed without a dress form. It sounds like it must have been complex and time consuming to get everything adjusted right. Helena is really dropping the ball lately! Lazy days of summer? My daughter and I made one using the duct tape method described by dianaschwenk. She’s much older now, so it’s fun to compare how much her little torso has grown and changed. What a wonderful project. . .And, it sounds like so much fun to be still have it years later. Our granddaughters are mini dress designers of sorts & use modern dress forms. They are many places that have new versions, but would be grand to have an antique Acme. What a fun activity for you granddaughters! I bet they look gorgeous. My daughter-in-law is a fashion designer and has a dress form of some soft-surface black material…these antique ones are much nicer! The old ones are awesome! So cool. Reminds me of my grandmother. Not the form, the idea of it haha. Yes, that might be it! It sounds like Grandma was too tired to think. Bless her heart. A lot of the women back then did some sort of needlework or sewing, I wonder if your Grandma had a dress form. I always wanted a dress form. I’ve got it in my mind that I may try and make one someday using the duct-tape idea, but I probably won’t. I always wanted one, too–though I’m not sure why. I never was a very good seamstress and I haven’t sewed in years. Grandma must have been having some busy days, and going back to write in her diary at a later date. That’s was I think, too. . . that she was working very hard. I don’t still have one, but I did back in the 60s. I wish I had it now just so I could check to see how much my figure has changed, not that I’d expect good news.